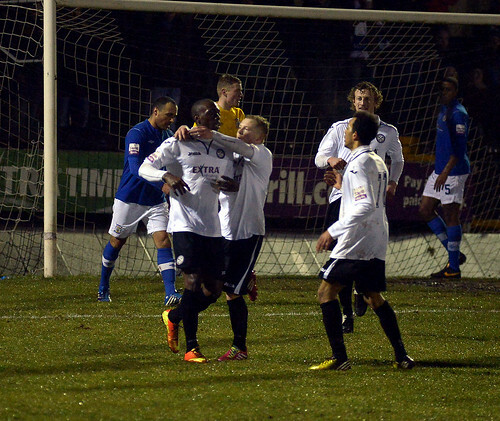 Hednesford Town were able to move back up into second place in the Skrill North following a dominant 3-1 victory over former Football League side Stockport County. On a windswept night at Keys Park, goals in each half from Neil Harvey and another from Jamey Osborne proved to be the difference for the home side who also had the advantage of playing against ten men for 71 minutes, writes Scott Smith. This was the first ever competitive meeting between the two sides and the game got off to a lively start with Hednesford goalkeeper Dan Crane being forced to act quickly twice to prevent the visitors opening the scoring, whilst at the other end Osborne saw a shot superbly tipped wide by Ian Ormson, all in the opening five minutes. Harvey should perhaps have done better in the 12th minute after nicking the ball off Jordan Fagbola but he shot wide from just inside the penalty area. However, he made no mistake five minutes later as he prodded home at the back post to give Town the lead after the visitors had failed to clear their lines. 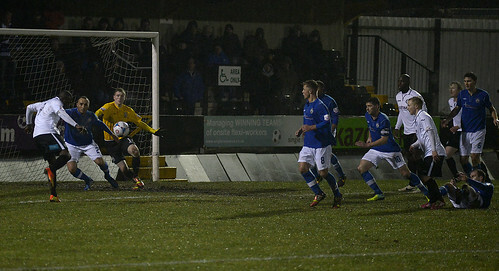 Stockport almost responded immediately with Kristian Dennis seeing his effort cleared off the line by Darren Campion. 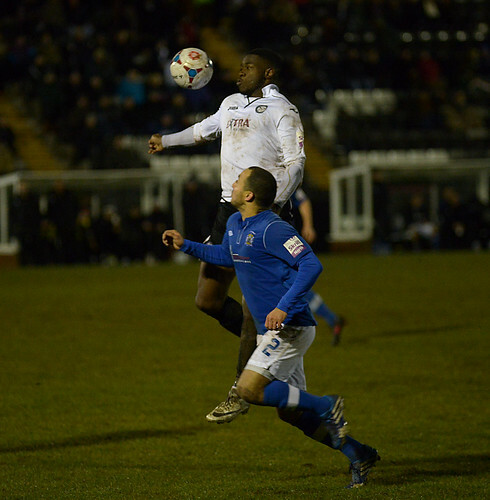 However things soon got better for Town when County’s Tunji Moses was shown a straight red card for a late tackle on Elliott Durrell in the 19th minute. 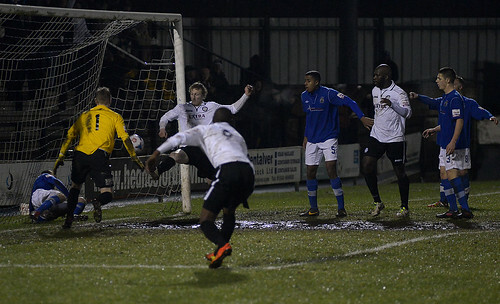 Despite this man advantage The Pitmen were unable to extend their lead going in to the half-time break. Five minutes into the second half they managed to find that second goal though, as Francino Francis nodded on a Paul McCone cross to Osborne who superbly drilled the ball home via the upright. The game was as good as over in the 55th minute as Town added a third when Harvey flashed home a header off the post following a Durrell corner. This came after the front man had burst forward and seen a good downward header saved for the resulting flag kick. Despite the scoreline and the man disadvantage County kept pressing and Crane was forced into two smart saves only to be beaten in the 66th minute when Dennis turned his man and slotted home from 12 yards. 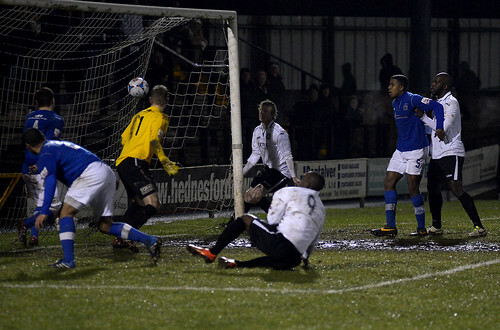 There would be no big comeback from the visitors though and despite both sides having half chances, including a shot from Town’s Nathan Blissett which got stuck in the mud in the six-yard box, no further goals would follow. 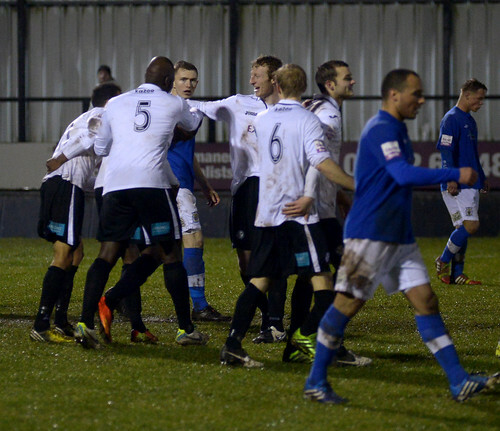 Hednesford will look to consolidate their position in the league when they travel to Bradford Park Avenue on Saturday 18th January, 3.00pm kick off.